Textile Prints in High Resolution made by eclipse | Eclipse Print a. s.
Nowadays, Point of Sale and Outdoor Advertising are not imaginable without high quality prints on textile materials like on PES Display, Satin or Canvas materials. Framed pictures, palette decorations, ceiling hangers or flags are the most popular products, but there exist far more than that. Varying surfaces and haptics of the material, low weight and the ability to wash many textiles are only few advantages of these steadily evolving materials. Eclipse stays abreast of these changes and has invested into new machines like the Agfa Aquajet, d.gen Artrix and the d.gein Arachne. All of them are sublimation printing machines with different roll formats, printing speeds and resolutions. Therefore, eclipse is ready to print textiles on the ideal printing machine. Common for all three systems is the sublimation which means, that the color is fixed at about 200 degrees at the substrate. The print is brilliant and detailed in colors, inks cannot break so folding is no problematic anymore. Sublimated textiles can be even washed or ironed in many cases. Special motives that require even more detailed pictures are printed first onto specially coated paper and then sublimated via a so called “Kalander” to the fibre. 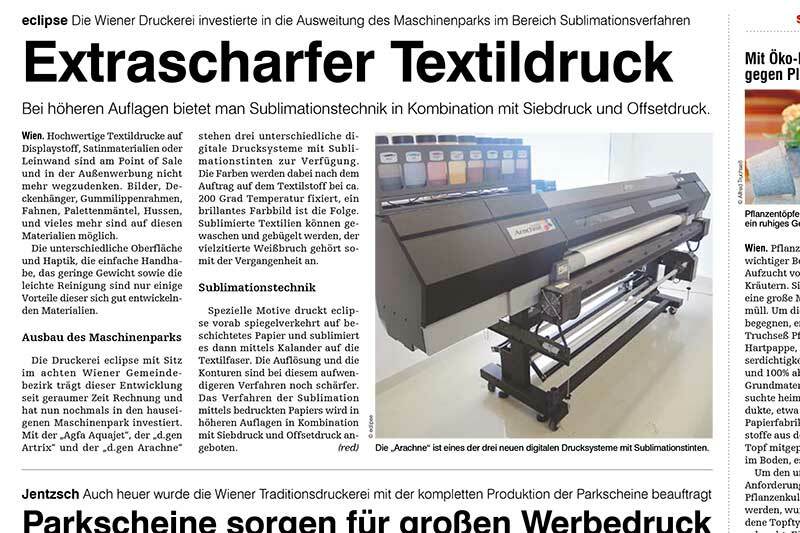 Same procedure eclipse offers in combination with screen or offset printed transfer papers for higher runs of textiles.